At the east side of Kyoto Imperial Garden, there is a temple called Rozanji. Rozanji was established in 938 by the Buddist priest, Ganzan-Daishi (912~985). It is said Ganzan-Daishi started “Omikuji”, Japanese fortunetelling papers at temples or shrines. Omikuji was originally a paper that tells a fortune of the person based on Ekikyo, ancient China’s fortunetelling. This land used to be a mansion of Murasaki Shikibu (978?~1019? ), the author of “The Tale of Genji” in Heian period. Her grand grand father, Fujiwara no Kanesuke (877~933) built a huge mansion here and her father Fjiwara no Tametoki inherited it. Murasaki Shikibu is a famous novelist and poet. “The Tale of Genji” is one of the most be loved classics of Japanese literature. She had a daughter, Daini no Sanmi (999~1082). She is also a famous poet in Heian period. Murasaki Shikibu raised her daughter and worked at the court, and the same time she wrote The Tale of Genji. It is said that she spent almost all her life here and created many great works. At Rozanji, there is a beautiful garden called Genji-Garden. 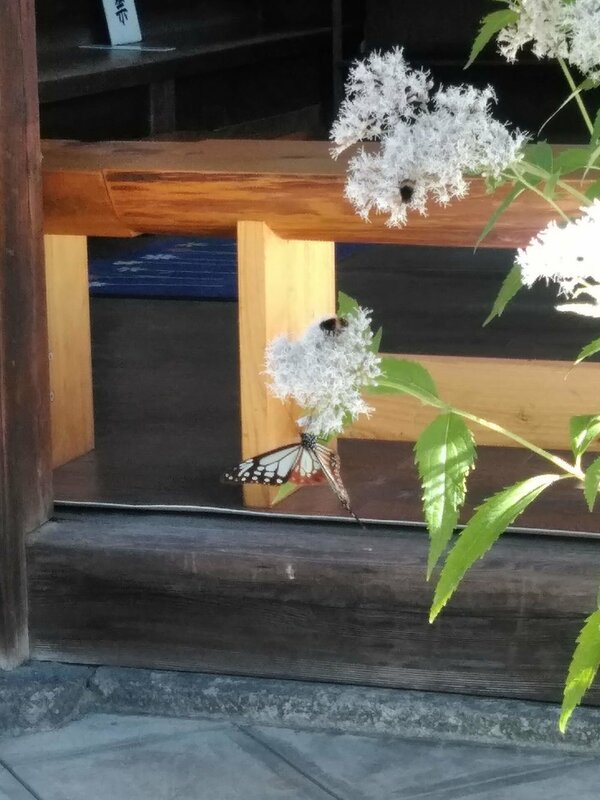 At the beginning of autumn, you may see a beautiful butterfly called Asagimadara here. In Kyoto, you can see it for a limited time only. If you are interested in Japanese literature and The Tale of Genji, please visit Rozanji. You’ll feel the atmosphere of a life of the nobility in Heian period.